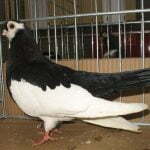 The Gascogne Pigeons– also known by names: Gascogne-Taube, Blu della Guascogna, Гасконский голубь – are old varieties derived from Gascogne, Francis, and are estimated to have been cultivated since the 1800s, rural areas. 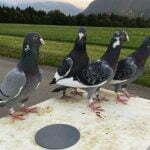 Varieties belonging to this type of Utility form pigeons, in the past were developed primarily as “feeder” pigeons, ie doves released for fishing and hunting other pigeons. But in recent developments, these varieties are more maintained for the show. 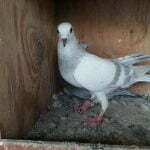 I would like to find somebody having Gascogne pigeons so they could send me growing feathers. I am a geneticist, and I am trying to discover the gene causing the absence of bars on their wings.